The original MPC body and Modelhaus hood are coated with Duplicolor "Ultramarine Blue Metallic", a dead-on match for B-5 Blue paint. Ron added a set of outside mirrors from the aforementioned 1969 GTX kit. He drilled out the moulded-in headlamps from the grille and added clear lenses. 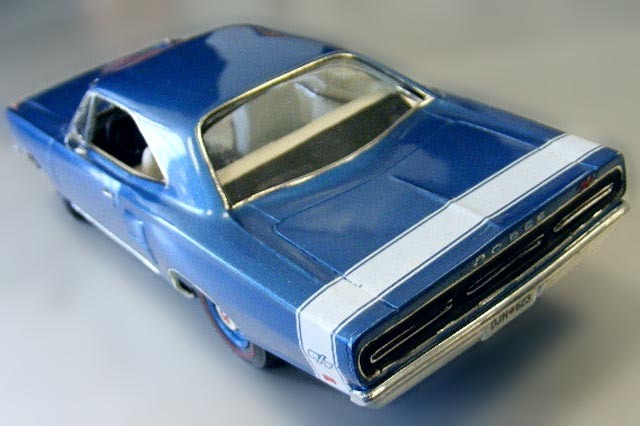 Ron highlighted his fine paint work with a white “Bumblebee” stripe from a Fred Cady decal sheet and added select photo-etch pieces from the Model Car Garage added for effect.